On 28 May 1923, a letter was sent from the District Council of Mallala to the S.A. Fire Brigades Board requesting fire protection for the Mallala area. A letter of acceptance was received on 4 September 1923 recommending Albert Henry Huxtable to be the Auxiliary Foreman and that he be paid a retainer. At first he was equipped with a bell and a handcart with which he ran to the scene of the fire. Townspeople would form a bucket line to fight fires in the township. The only other means of fire defence outside of the township was by means of a wet sack or hastily cut tree boughs. Albert Henry Huxtable completed 27 years of service with the Mallala brigade and his attendance and duties were recorded until the day before he died. During the early years the employees of East Bros Co. (where Mr Huxtable was an employee) comprised most of the fire fighting team. In 1939 a state organization named the Emergency Fire Service (E.F.S.) was founded. State and District training schools were introduced and district and rural fire fighting bodies were affiliated. 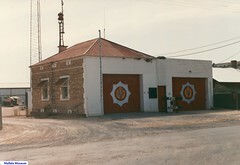 The first Fire Station at Mallala was an iron shed near the corner of Dublin Road and Railway Terrace. Between 1941 and 1945, the majority of fires were incidents from house chimneys catching on fire, farmers burning off stubble fires, incidents at the Mallala R.A.A.F. training base and fires started by the steam trains along the railway corridors. Mr A.E. Algar was instrumental in seeking the installation of the first siren (a World War 2 air raid siren) installed by headquarters’ electricians on 16 October 1945 and Mrs Les Jury (a member of the brigade) operated the alarm system as she lived nearby. The siren was tested every day, except Sundays and Christmas Day, until 17 August 1949 after which it was tested every Saturday at 12 noon. Mr A.E. Algar usually did this. This siren was used until 1994. 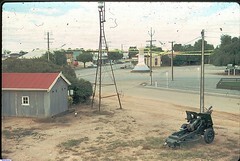 On 6 October 1945 a Chevrolet Hose Carriage (with 2,497 miles on the speedo) was delivered to Mallala and the old Reo hose carriage was returned by goods train to Adelaide. 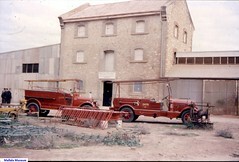 Extensions were made to the Fire Station on 19 October 1945 by the District Council of Mallala and completed on 10 November 1945. The station was lengthened to house the Chevrolet and a hose trailer. In 1957 the fire service moved and commenced operation from the former District Council office on Aerodrome Road. The Ambulance building was next door. When a new Ambulance Station was built in 1975, the fire brigade used the St John Ambulance obsolete building as a meeting and communications room and equipped it with radios, as the Council office and their radio network had been used during callouts up until then. 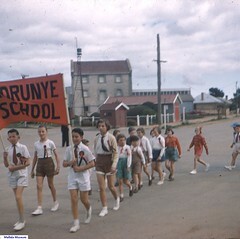 In 1958 the Mallala E.F.S. started regular fortnightly meetings and training sessions. In 1965 the Reo Speedwagon returned to Mallala and became the backup vehicle while the Chevrolet hose carrier became the E.F.S Light Rescue vehicle at Mallala. 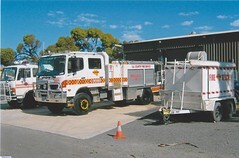 During 1967 a new Ford F600 was commissioned and in 1971 the Chevrolet hose carrier was returned to the Hindmarsh Museum. In 1977 the new S.A. Country Fire Service act was proclaimed and the Emergency Fire Service at Mallala had a name change to Country Fire Service. 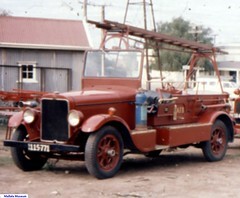 In 1985 the old 1928 Reo Speedwagon fire engine (now on display in the Mallala Museum) was replaced with a new Ford Ttrader which held 1000 litres of water. Mallala also had a Ford F500 with a 3,000 litre water capacity. The Ford F500 was replaced in 1989 with a Hino 22 (2,000 litre capacity, 2wd truck). The Ford trader was replaced in 2003 after it was damaged while fighting a crop fire in November of that year. The truck that replaced it was a second hand Hino 22 (2,000 litre, 2wd). The first Hino 22 was later replaced by a new Hino 34 (3,000 litre, 4wd) in 2007. The brigade also has two trailers. A small trailer is used to transport a cable used for haystack fires and also carries a portable dam. The second trailer is a support trailer, which has tea and coffee facilities, generator, lighting and spare equipment for use when incidents become prolonged and during the night. 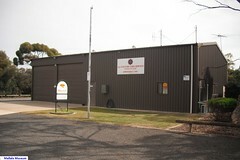 In January 1994 the Country Fire Service at Mallala moved to a new building on Railway Terrace with the relocation occurring whilst several members were in the midst of fighting fires in Sydney N.S.W. A new siren was installed but is now only used for major fires in the district. All crew are now equipped with a pager that alerts them of incidents. Fire! Fire! First Alert at Avon on January 22nd 1948 Teenager Val Clark worked at the Avon General Store and Post Office and on the fateful day was delivering the bags of outgoing mail to the Avon railway station to be deposited on the midday train from Port Pirie to Adelaide. Val glanced northward and could see smoke on the railway corridor in the direction of Kallora. Val raced back to the shop to tell the owner and he instructed her to get on the switchboard and notify everyone by telephone that the fire was coming. Val was able to pull all the switchboard plugs out at once and let everyone know about the danger. What a valuable service in an emergency. Do you remember Country Fire Service ? Then Join up and add your memory here.